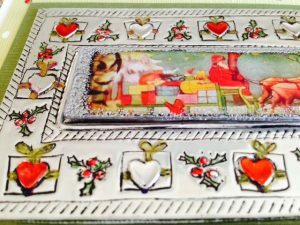 I offer mixed media metal art classes and workshops at retail craft stores and social groups in Canada as well as at my studio in NW Calgary. See below for Workshops. The “drop-in’s” are a great success and many an unfinished project has been put to bed! Typically “Drop – In” is on a Saturday between 9 am to 4:00 pm. You can arrive anytime between those hours. There is a small charge of $10.00 and the only requirements are that you had taken a workshop from me before and that you have an idea of what you will be working on. Please bring a lunch and indoor shoes. Please email me on harts@shaw.ca if you plan to come-only 8 spaces available. 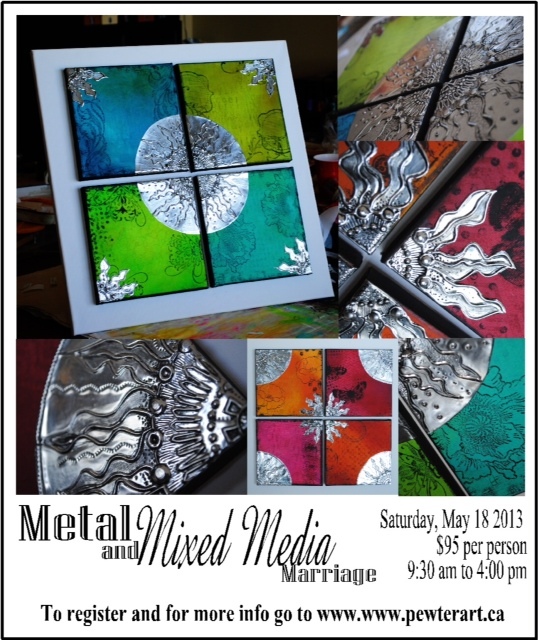 This will be a great opportunity for you to complete unfinished projects or rub shoulders with other metal and mixed media enthusiasts while I am around to serve you tea, coffee and snacks and hopefully be of help with your metal emboss questions. 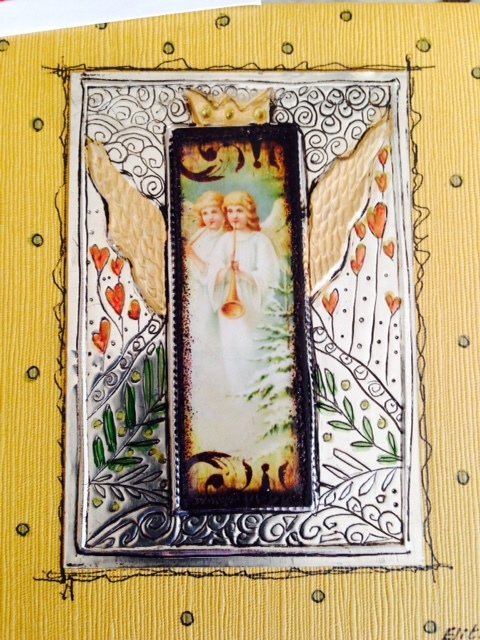 Drop In Dates :******** I have run out of Saturdays for “drop in” 2016! 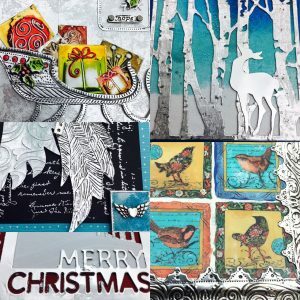 In this full day workshop you will complete 6 different Holiday themed cards while learning different card making techniques with die-cuts, embossing folders, texture plates and crackle mediums with the help of expert card maker Belinda Bender. 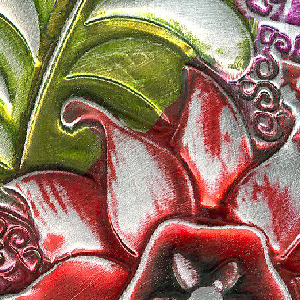 Color will be applied with alcohol inks and metal acrylic paints. 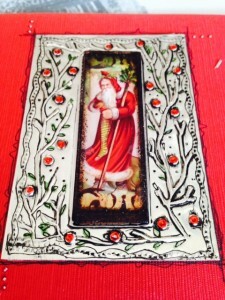 You will also learn (among other techniques ) how to do the exciting craft of reverse painting on acetate. 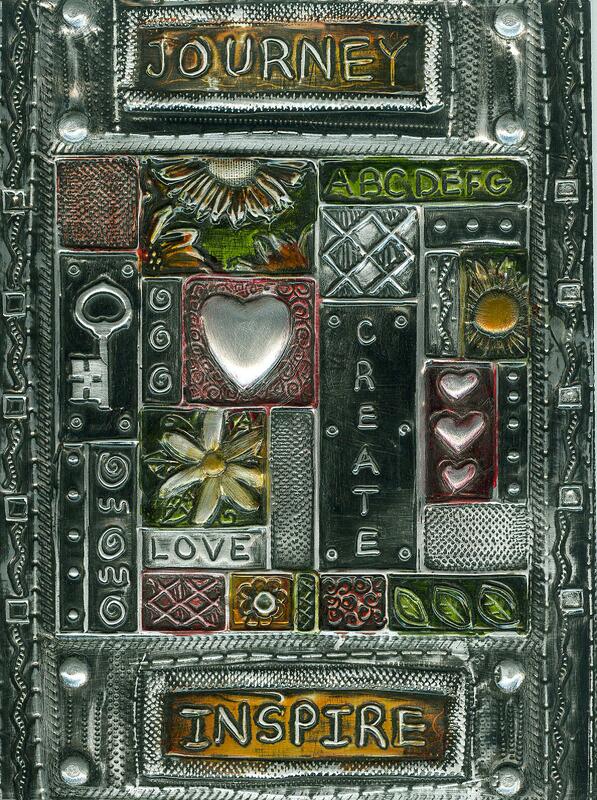 Your mediums will be aluminum foil tape and pewter sheet on the lovely Japanese linen square cards. All supplies are provided. Please bring : Your lunch and indoor shoes. I provide coffee, tea and snacks. Full payment on registration on my website Online Store Please note no refunds on cancellation, credit will be applied to future workshops. Please email Elitia on harts@shaw.ca with queries. In this intensive full day workshop you will complete a bookmark and a pewter plaque that can be used as a book cover or wall art. 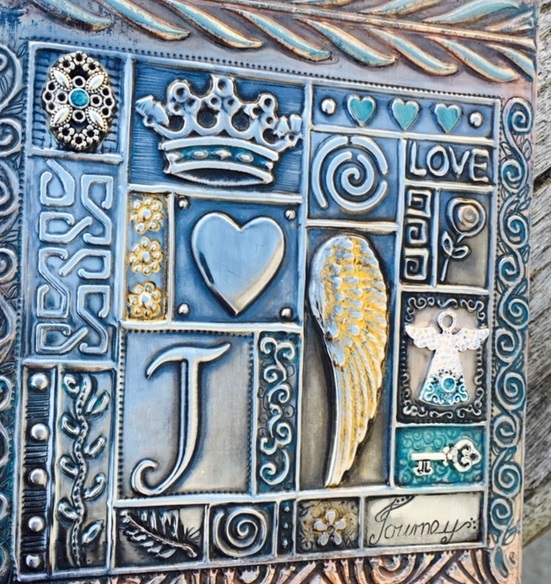 You will be introduced to a variety of metal embossing techniques and tools as well as how to use texture plates and stencils.You will also learn how to do lettering on metal. 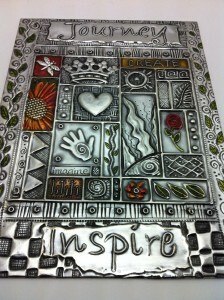 You will be using luscious pewter sheet and will learn to apply patina and color to your project. 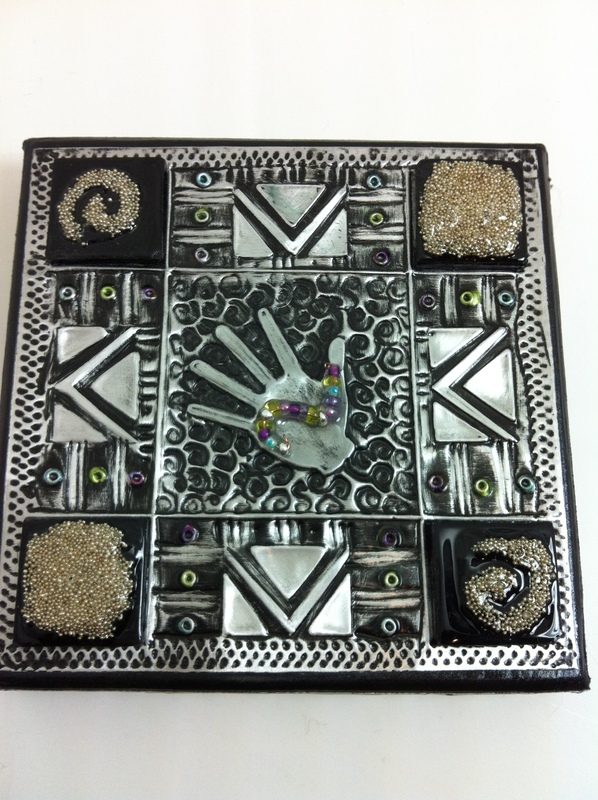 All supplies and tools to use in class are provided to complete your project and bookmark. Please bring : Your Lunch and indoor shoes – I provide Coffee, Tea and snacks. Full Payment on registration on the Online Store – Unfortunately no credit on cancellation-credit will be applied to future workshops. Please email Elitia on harts@shaw.ca for more information. 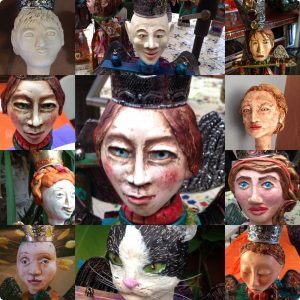 She is a super talented and fun teacher and I am so excited that she agreed to share her brilliant sculpting techniques with us! In this full day workshop, mixed media artist Lynn Leahy will share her passion for sculpting! 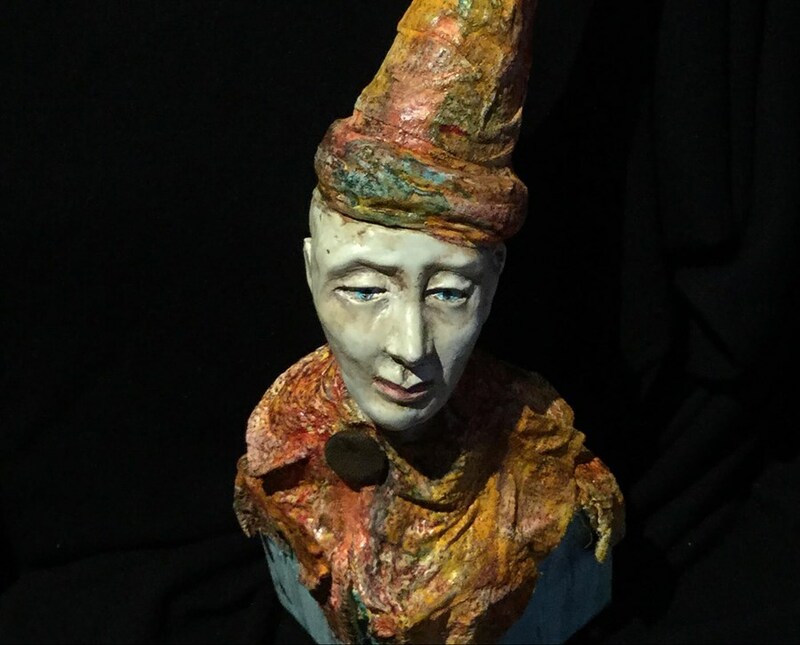 She will teach us how to use paperclay to create a face and torso sculpture and will be giving up her secrets on how to drape and shape versatile rigid wrap. 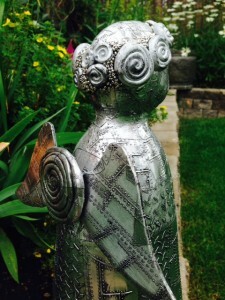 Lynn will also guide us as we apply a beautiful patina to our completed project. All supplies needed are included in the class fee. 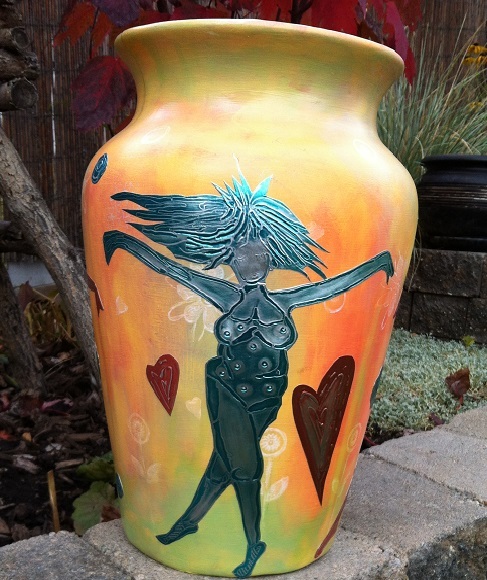 Cost : $175.00 CAD -please email me on harts@shaw.ca for registration and payment details. Please bring : Your Lunch, indoor shoes and an apron. I will provide coffee, tea and light snacks. 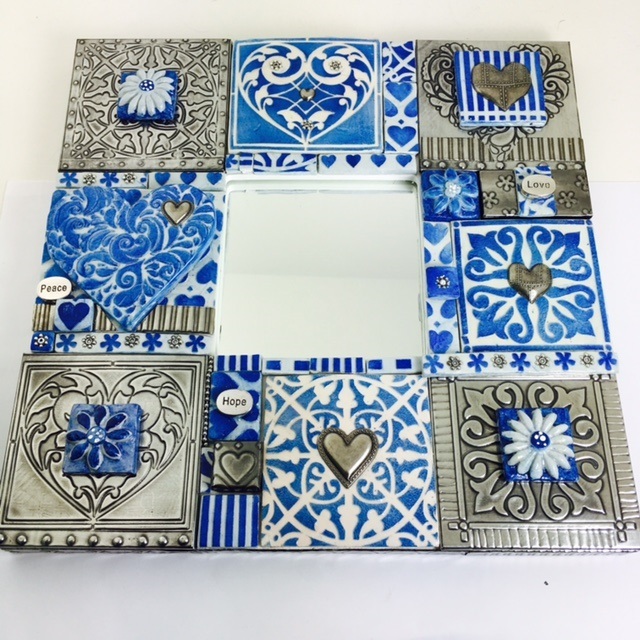 In this full day workshop you will learn how to create pewter and polymer clay mosaic tiles using the Mimmic Gallery and Studio mini stencils to complete a small mosaic mirror frame. 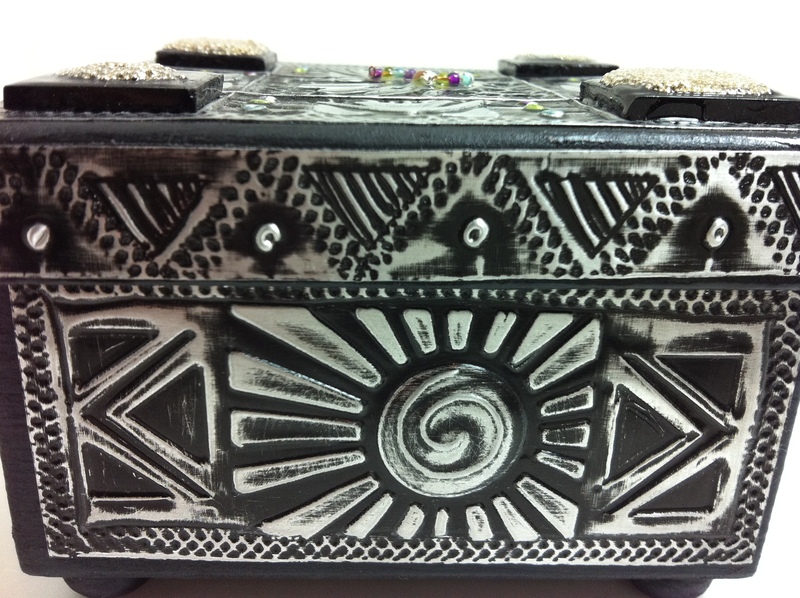 Please note that this project focus is on polymer clay and few metal embossing skills. You will have an opportunity to create your own color scheme as well as add personal embellishments, layout and design. 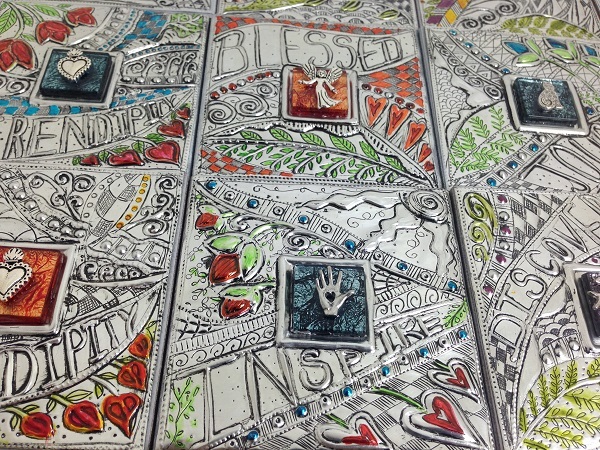 Each student will receive two stencils to keep, all supplies needed to complete the project and use of class tools. Please Bring : Your lunch and indoor shoes. 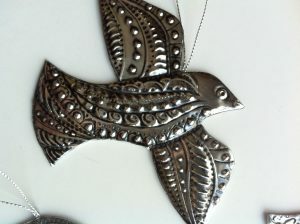 Full Payment on registration on my website www.pewterart.ca online store- Unfortunately no credit on cancellation-credit will be applied to future workshops. Please email Elitia on harts@shaw.ca for more information. 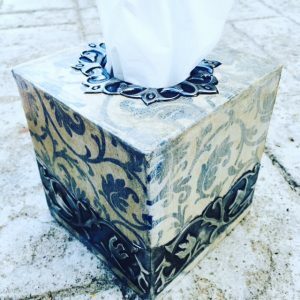 In this full day workshop you will learn how to create a background surface on this paper maché tissue box holder, using napkins and paint techniques. 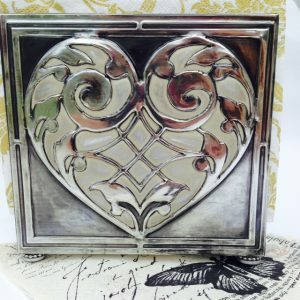 You will also learn how to transfer design (lots of different designs to choose from) onto pewter sheet, emboss, fill, patina, cut and apply the pewter embellishments, creating a beautiful tissue box cover. 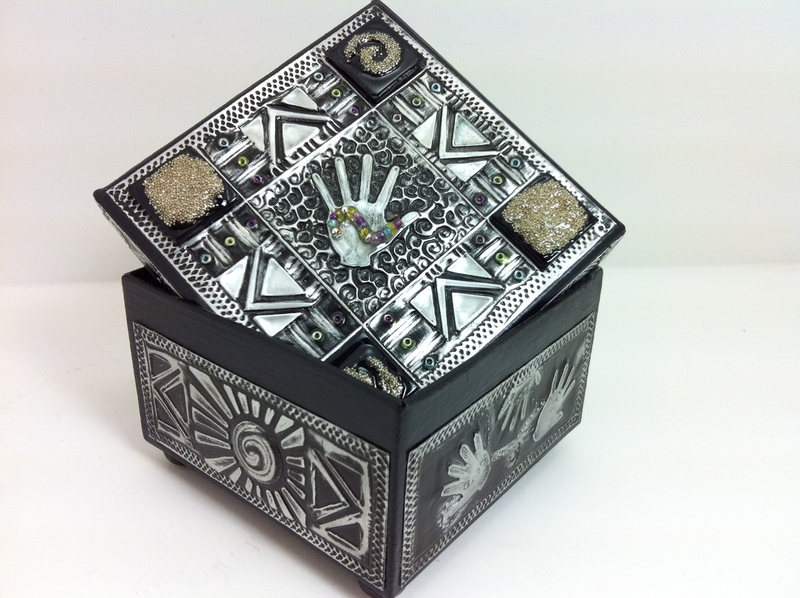 All supplies are included as well as the use of class tools. 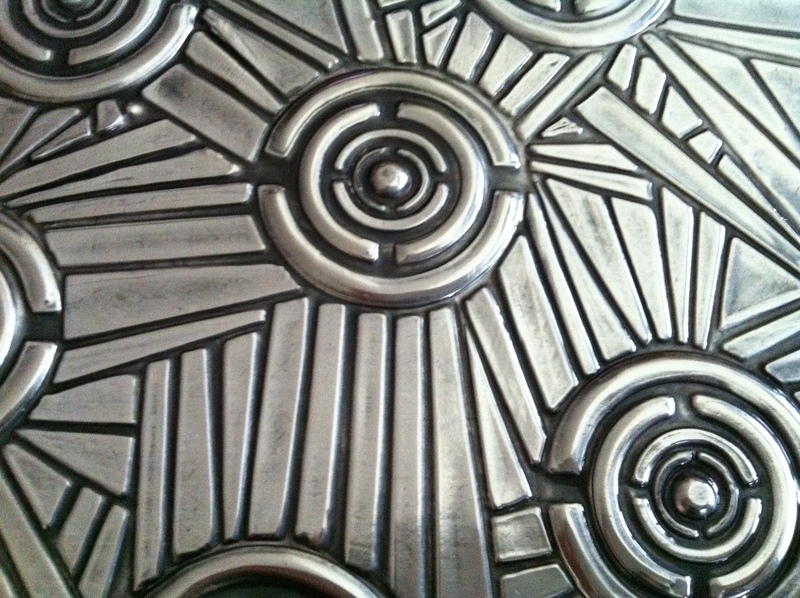 Embossing a face in metal can be a very intimidating prospect! 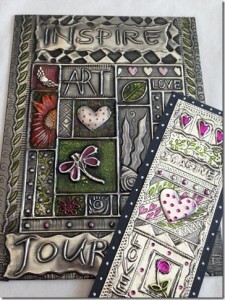 The gorgeous Prima Marketing, Bloom Collection rubber stamps by Jamie Dougherty makes it a little easier. These designs translate beautifully into metal embossing and the Vintaj Patina & Glaze add some pretty color accents! 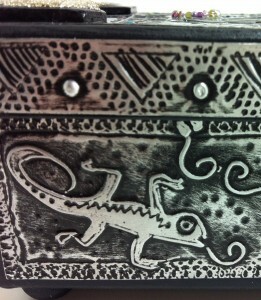 In this workshop you will learn how to stamp on metal and how to gently approach embossing a face on pewter sheet while learning a few key techniques for a good outcome. You will also be introduced to the Vintaj Patina and Glaze and how to apply these paints specifically developed to be used on metal. 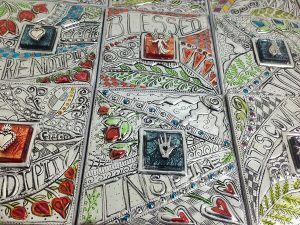 Students will have a choice of a variety of these stamps and the two completed piece will be filled with beeswax, cut and mounted onto a board canvas. All supplies are included and class tools are available for use. 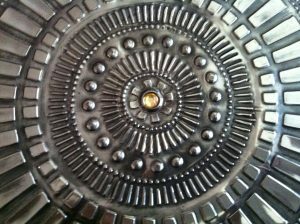 This is not a beginner workshop as a good understanding of the workings of the metal and tools is a requirement. You would need to have taken a workshop from me before. Location : NW Calgary Studio, I will email you the address once registered. 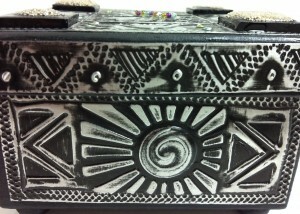 Please Bring : Your lunch and indoor shoes and an extra fine paintbrush. When my sister Tanya visited from South Africa I took her for the required Dollar Store Shopping experience. 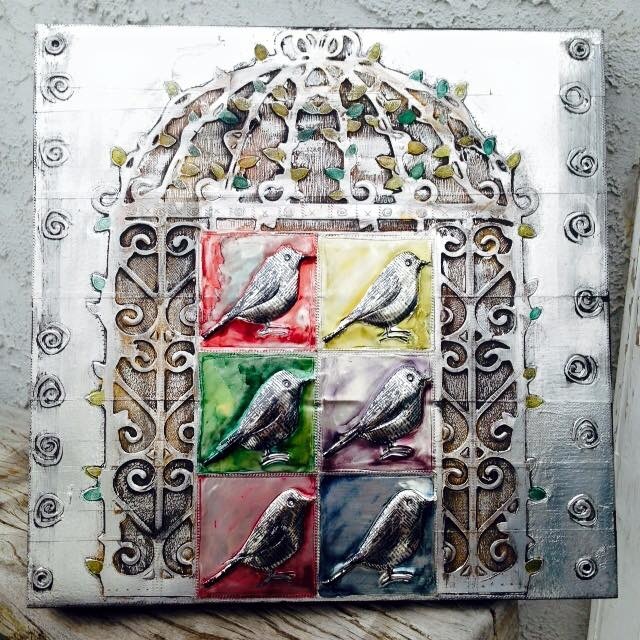 With a fresh eye and her love of metal aluminum tape art she spotted a few treasures and this Birdcage project came alive! 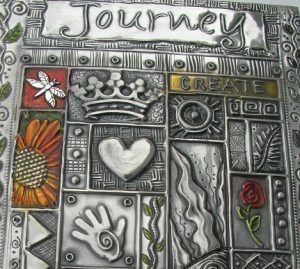 On this 20 x 16 inch canvas you will learn the fundamentals of metal aluminum tape art as well as stamping and high relief embossing on pewter. You will also use alcohol inks to create interesting backgrounds. All supplies provided. 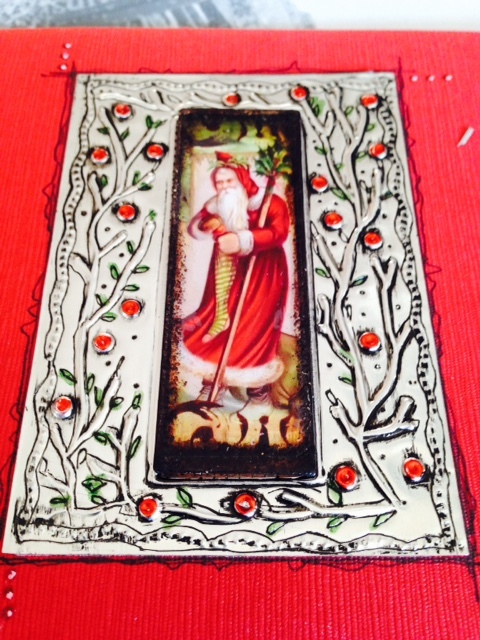 In this fun full day workshop you will complete 6 Christmas Holiday themed cards. We will show you how to use Bigz die cuts and embossing folders in the Big Shot machine using cardstock and aluminum. 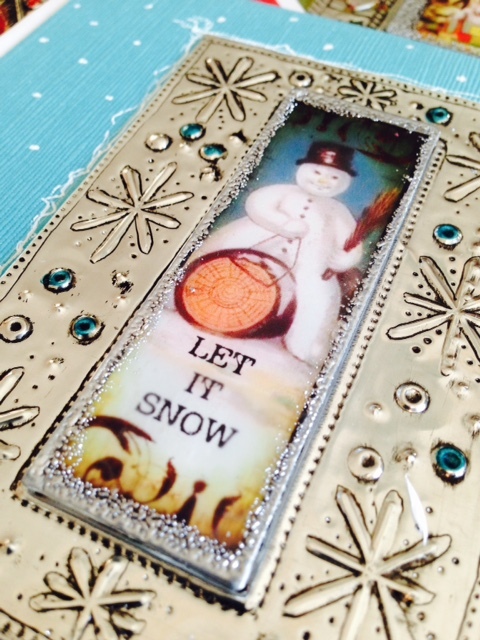 You will learn how to create lovely backgrounds with alcohol inks, distress text papers, how to de-boss on aluminum tape, as well as how to create a faux “soldered” border look and a funky faux metal wire mesh using heat embossing powders. All supplies are included –please bring your lunch and indoor shoes. Skill Level : Beginner to Intermediate. 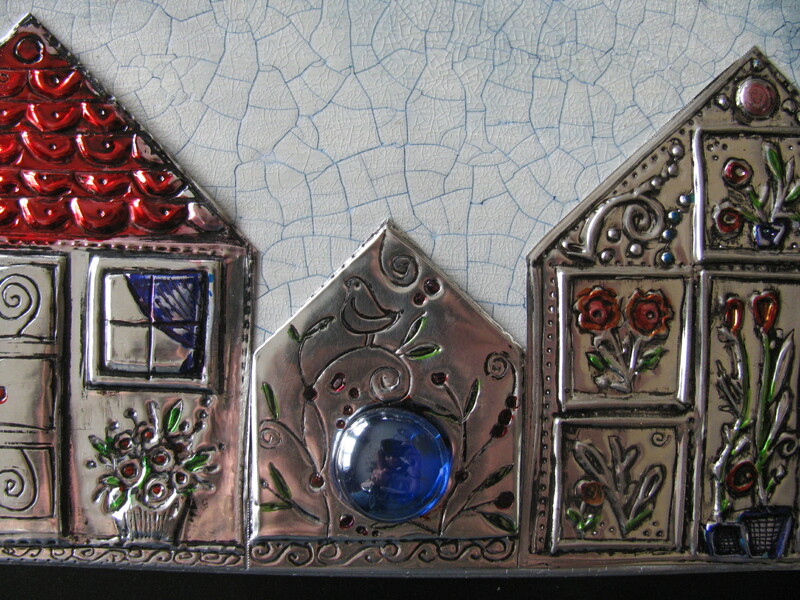 Full Payment on registration on the www.pewterart.ca Register on the www.pewterart.ca Online Store – Unfortunately no credit on cancellation-credit will be applied to future workshops. Please email Elitia on harts@shaw.ca for more information. 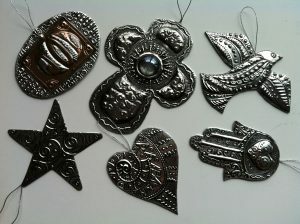 In this full day fun workshop you will complete 5 mdf-based double sided pewter sheet ornaments. 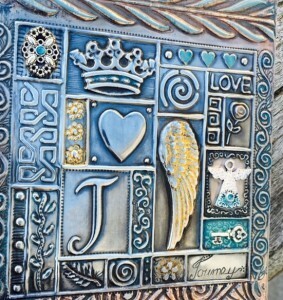 We will use basic metal embossing tooling techniques, including beautiful lettering on metal created by talented Yogi Grunwald. 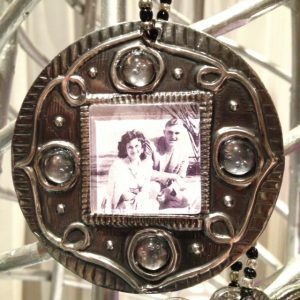 You will learn how to use pewter patina to oxidize your metal and simulate an aged look or black marker for a more contemporary finish. 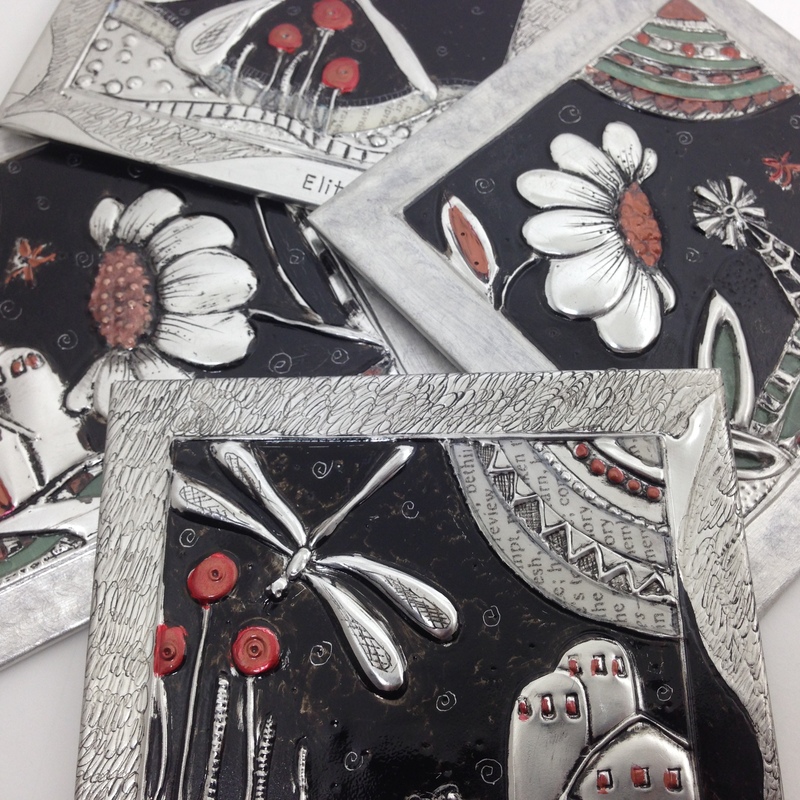 For those of you who wish to incorporate photos into your ornaments you will have the option of glass tiles or direct application to the metal-please email me your photos on harts@shaw.ca and I will size them. 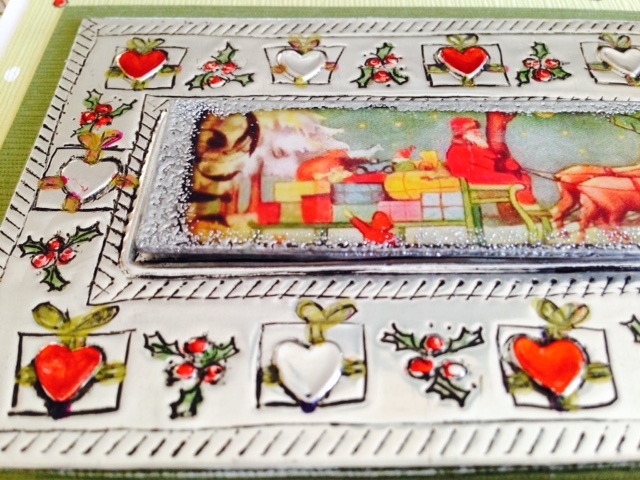 Some Christmas themed images will be available as an alternative to using photos. 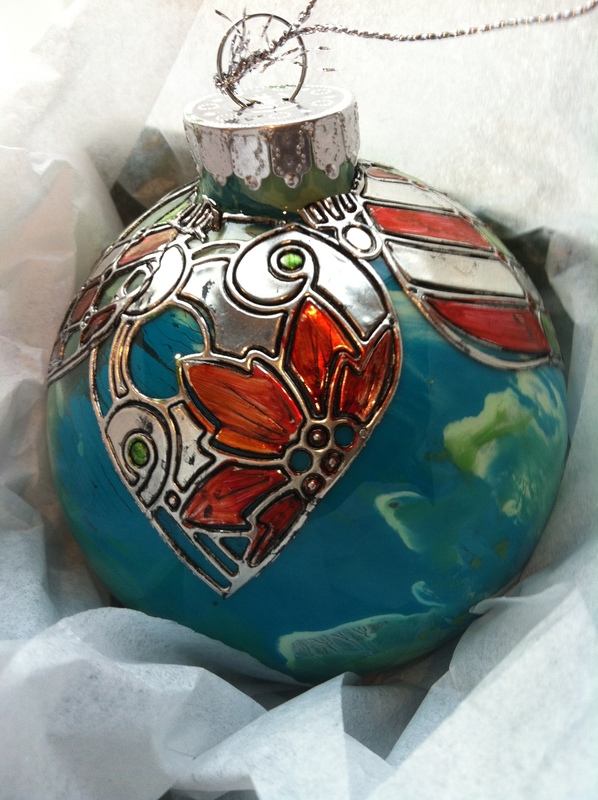 We will create some small bead hangers for easy attachment to your Christmas tree. 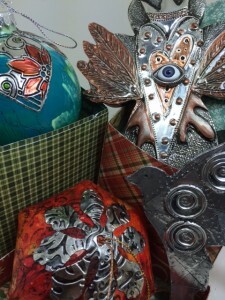 All supplies are included –please bring your lunch and indoor shoes and some good quality multiple use plastic gloves. 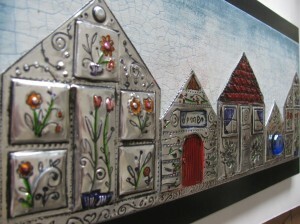 Full Payment on registration on my website www.pewterart.ca Online Store – Unfortunately no credit on cancellation-credit will be applied to future workshops. Please email Elitia on harts@shaw.ca for more information. 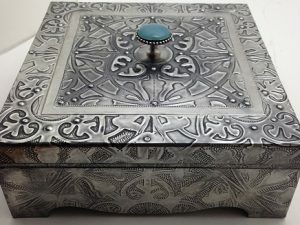 In this full day workshop you will learn stamping on metal (pewter) , high relief embossing and paint and decoupage techniques for your box. You will complete a small three drawer storage box with pewter. All supplies are provided including the use of tools in class. Should you opt to bring your own tools please ensure that they are clearly marked. 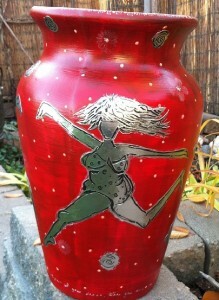 If you have a favorite paint color you would like to use please bring that along. Please Bring : Scissors for fine cutting, your lunch and an apron – I provide coffee, tea and snacks. 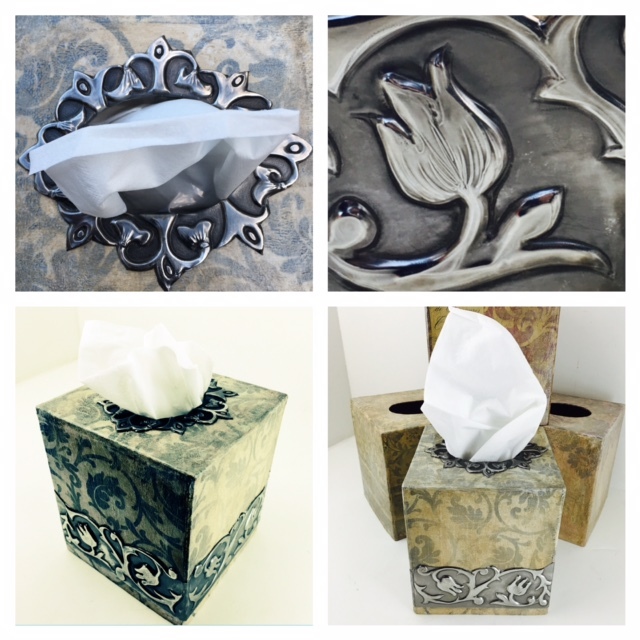 In this full day workshop you will complete a double sided Pewter Napkin Holder. 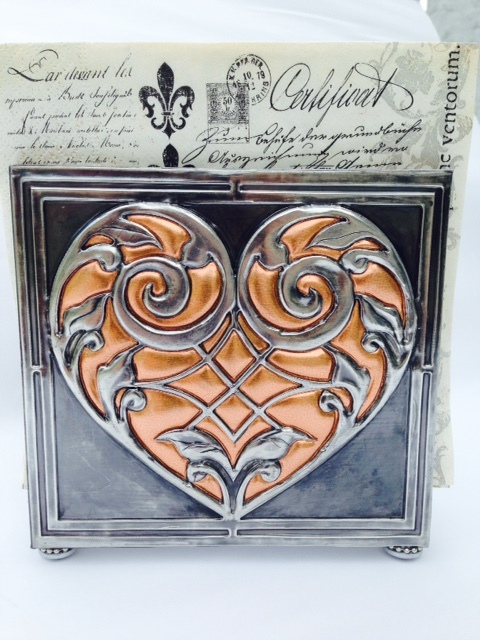 You will learn how to use stencils on metal, how to use your needle tool cutter, emboss, fill and patina your pewter design as well as how to apply metal adhesive tape to clad your project. 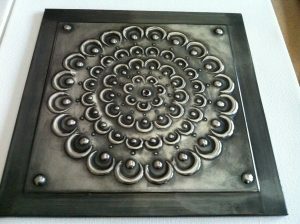 You will have a choice of a few different colors of aluminum color coated metal to use as backing for your pewter cutout. 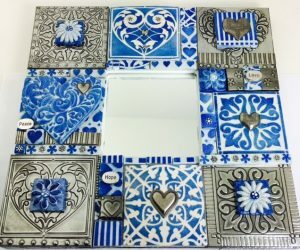 You will be provided with your own lovely Mimmic Heart stencil to keep and everything to complete this project including the use of tools in class. Should you opt to bring your own tools and mat set please ensure that all are clearly marked. Please bring : Your Lunch, I provide Coffee, Tea and snacks. Please bring : Your Lunch , I provide Coffee, Tea and snacks. 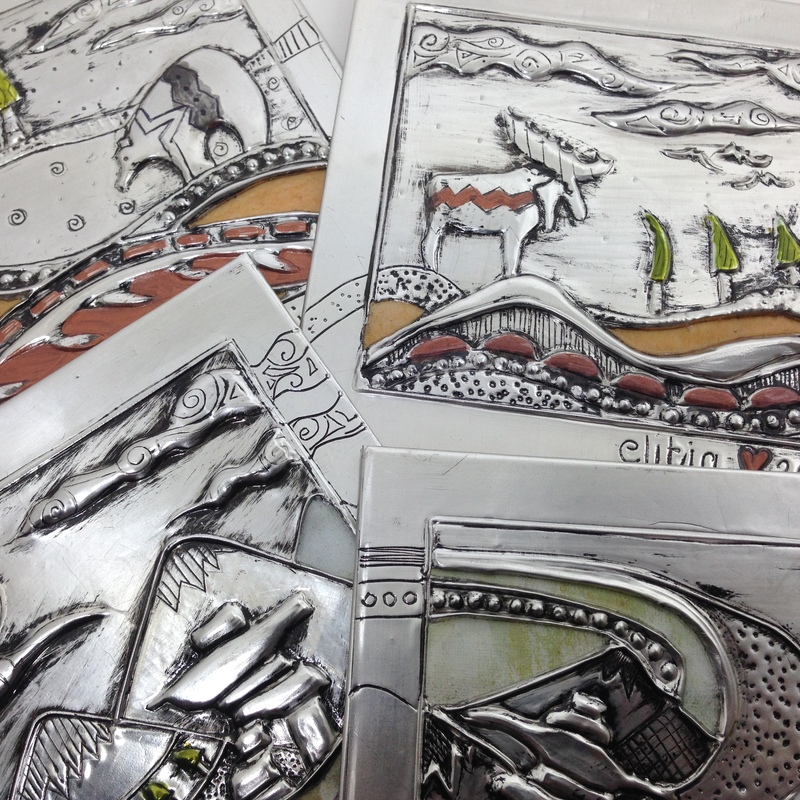 The Introduction to Metal Embossing : Pewter Journal Covers, is the most popular workshop and is a great opportunity to learn many of the techniques used in metal embossing. 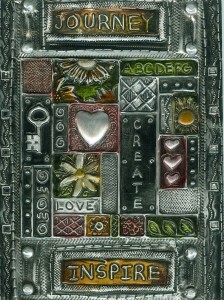 Take some luscious pewter sheet, incorporate various decorative wheels, add some balls, emboss on texture plates, learn how to do lettering on metal, erase everything or nothing, raise the metal, fill with melted beeswax, enhance with alcohol inks and then oxidize with patina……and that is how you emboss on Pewter Metal Sheet. In this 8 hour class you will complete a sampler bookmark with an introduction to different embossing techniques in a nutshell and a pewter sheet Journal Cover (enough pewter sheet provided for 2 covers). 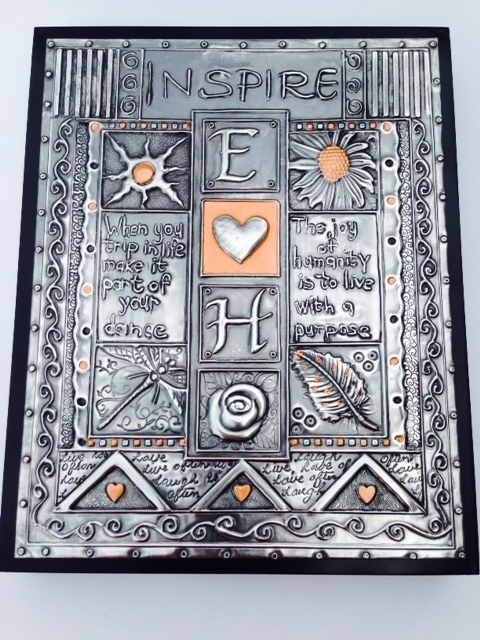 If you are a newbie to metal embossing, this intense workshop will introduce you to a whole new world of magic art metal and if you have done metal tooling before, this workshop will refresh your metal embossing skills and take it to a whole new level of inspiration! All supplies provided. To register online please go to www.pewterart.ca Store and Classes or alternatively contact Elitia on harts@shaw.ca. Full Payment on registration. 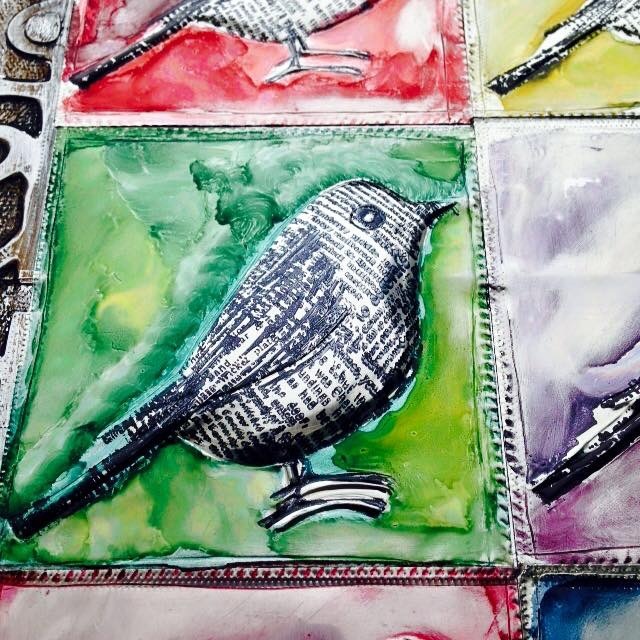 Unfortunately No Refunds on Cancellation- Credit to be applied to future workshops only. 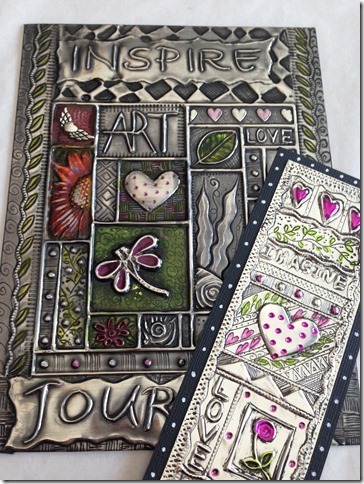 In this full day, intensive workshop you will learn a few different techniques using the lovely vintage look Mimmic Stencil on luscious pewter sheet. 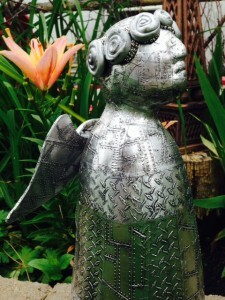 You will also have choice of the oxidizing patina finish or the black marker technique. 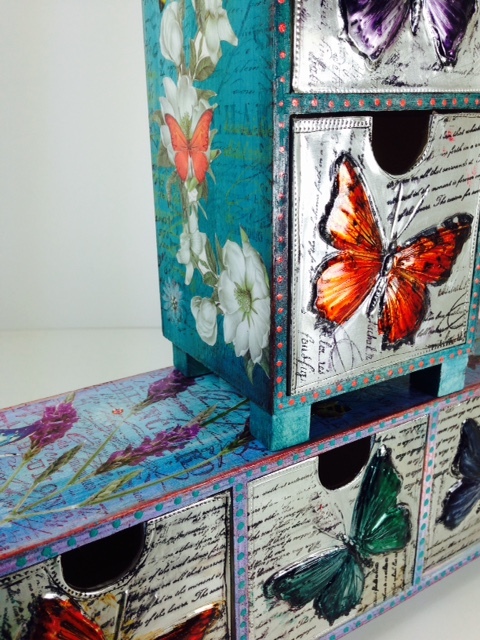 Your completed project will be a beautiful keepsake box measuring 20 x 20 cm. 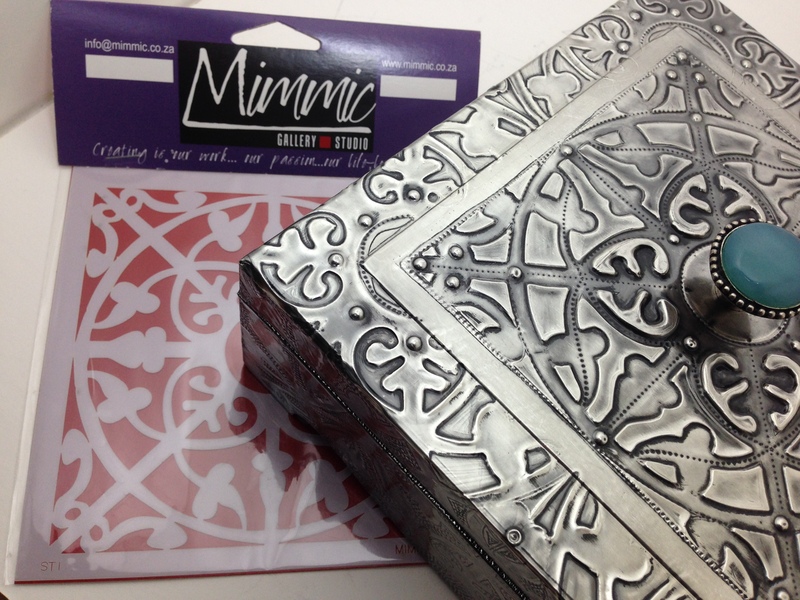 You will be provided with everything needed to complete this project as well as your own the Mimmic Stencil and a light lunch. 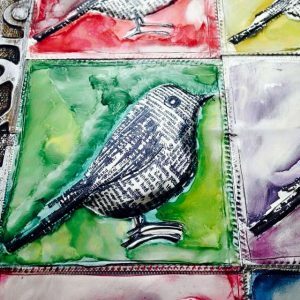 In this full day, intensive Memory Mosaic workshop you will learn a few different mixed media paint techniques to age your project as well as do lettering on Metal, and the process for working with vintage color coated aluminum and embossing folders. 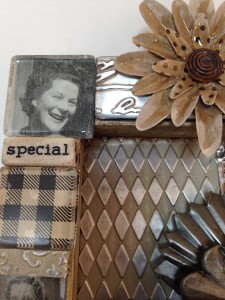 You will also learn how to alter and strengthen paper flowers to hold up in a mosaic as well as how to make your own custom mosaic tiles using decorative paper and glass squares and your own 5 photos ( optional- that you will email me prior to class for sizing and printing on photo paper). Everything needed for this project is provided, including the lovely nicho all the way from San Miguel de Allende in Mexico. This completed project can be wall art or on a stand (not provided) for table display. All you need to bring is indoor shoes and an apron-a light lunch is also provided. 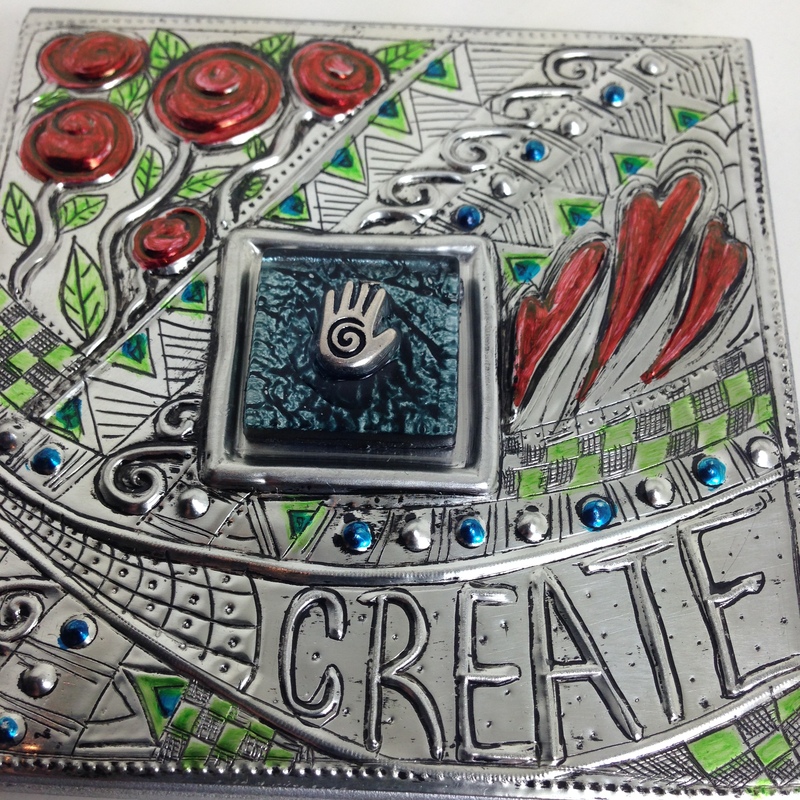 In this full day class you will complete two of the Pewter Creative blocks of your choice from my Creative Block Range with 8 different designs. You will learn many different metal embossing techniques; transferring design onto metal, engraving, low relief , high relief and how to use a dry needle point cutter. 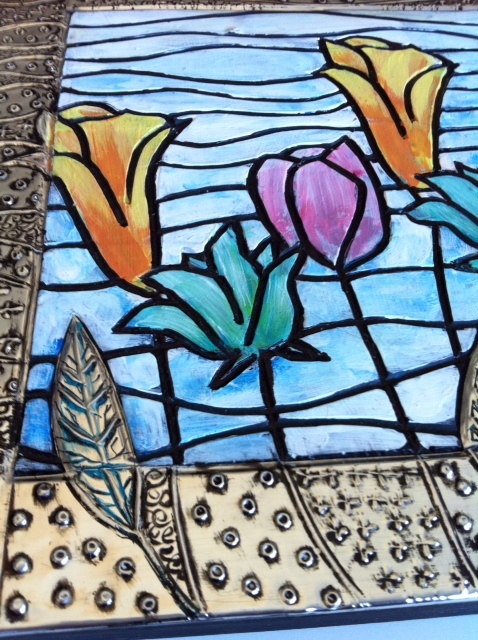 You will also learn how to fill your high relief embossing with beeswax and how to add patina and color to your project. These plaques can be used as wall art . You will be supplied with everything required to complete these projects including two small canvas blocks and a light lunch. 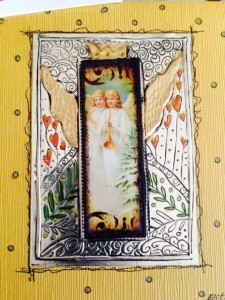 San Miguel de Allende Mixed Media Art Retreat : El Santo Real ~ The Royal Santo – SOLD OUT ! Great news! 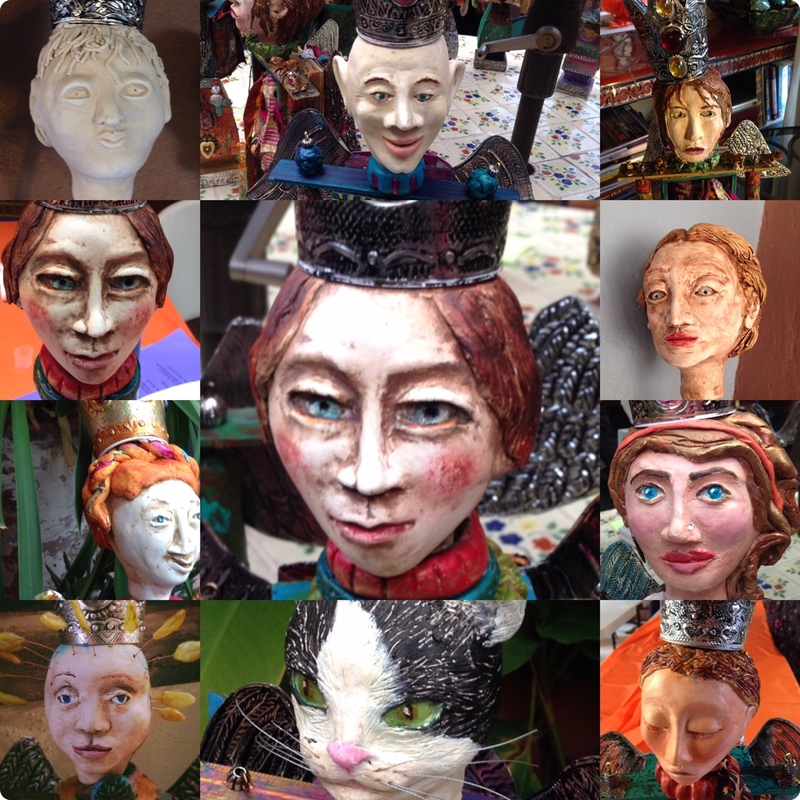 Registration is now open for the 2015 San Miguel de Allende Mixed Media Art Retreat. This year’s retreat will held October 28 – November 5, 2015.
smells, costumes and foods that take place during this time. instruct you in a new technique used to construct your Santo. 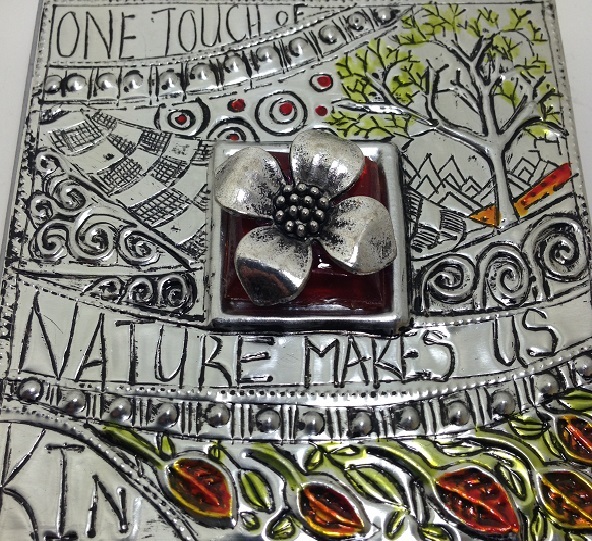 This year guest artist, Elitia Hart, will be joining us to add her creative medium of embossing on pewter metal. Tesoro del Corazon will be hosting an 8 night retreat at the beautiful Casa de la Noche Bed & Breakfast www.casadelanoche.com in San Miguel. This property, formally Madam Turcas Bordello, has been transformed into an oasis in the heart of the city. All rooms have private baths and high speed Wi-Fi access. Water is purified and safe to drink. As your home away from home, you will be able to enjoy many common rooms, including kitchen, living room, terraces and gardens. This is the perfect place to let your creative juices flow! 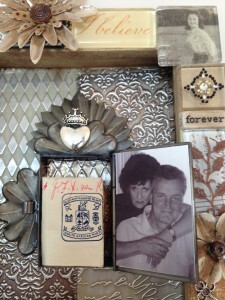 tesorocorazonretreats@gmail.com Please note new email address! 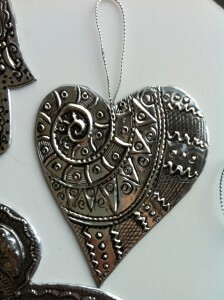 To register online please go to www.pewterart.ca Store and Classes or alter (natively contact Elitia on harts@shaw.ca. Full Payment on registration. Unfortunately No Refunds on Cancellation- Credit to be applied to future workshops only. 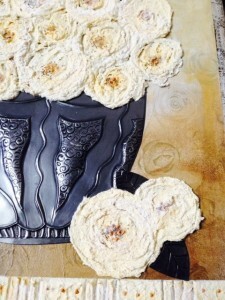 This vintage textured wall decor project was created by talented South African artist and teacher Tina Schilling , from www.decogecko.co.za, who has graciously given me permission to teach her technique and who also gifted me with the beautiful romantic roses background serviettes for this project. You will learn how to make a dramatic background using Modge Podge, a serviette and acrylic paints as well as how to make the lovely roses using texture paste. 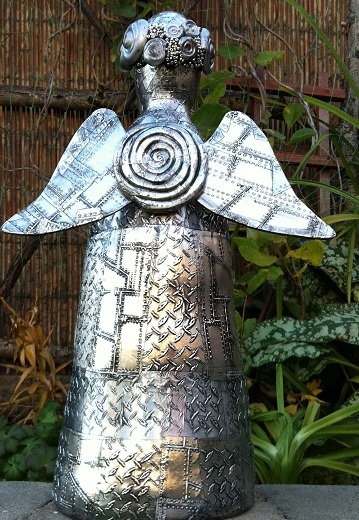 Using your basic metal embossing techniques on pewter we will make a vintage looking vase and your finished project will be attached to a canvas with a metal aluminum tape border. You will be supplied with everything needed for this project as well as a light lunch. To register online please go to Store and Classes or alternatively contact Elitia on harts@shaw.ca. Full Payment on registration. Unfortunately No Refunds on Cancellation- Credit to be applied to future workshops only. 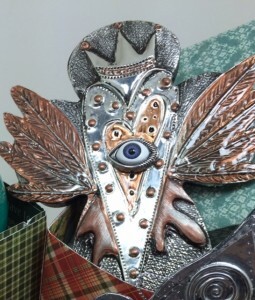 In this full day Saturday workshop you will learn to emboss, de-boss and texture the very versatile aluminum tape using embossing folders, die cuts and hand tooling on a tall 40 inch ceramic figure/angel. 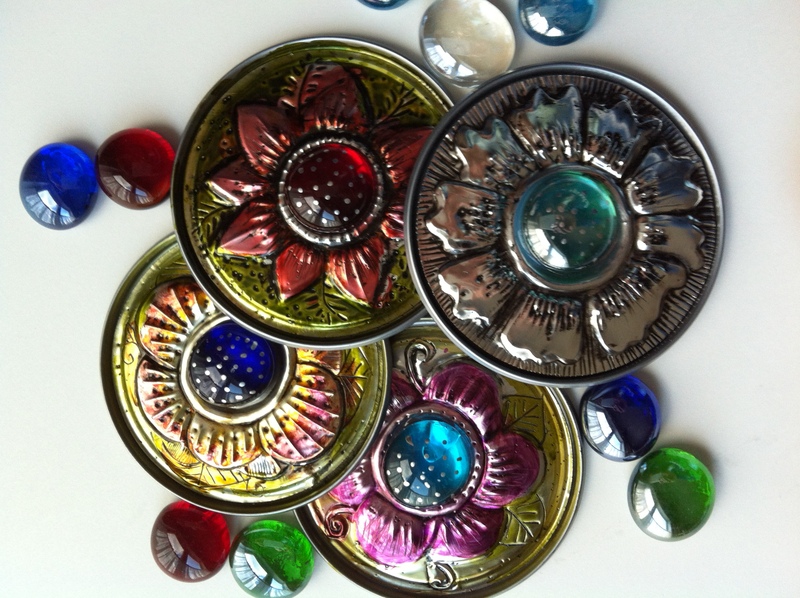 You will also create embellishments from polymer clay and be introduced to the qualities of epoxy clay. You will be supplied with everything needed for this project as well as a light lunch. 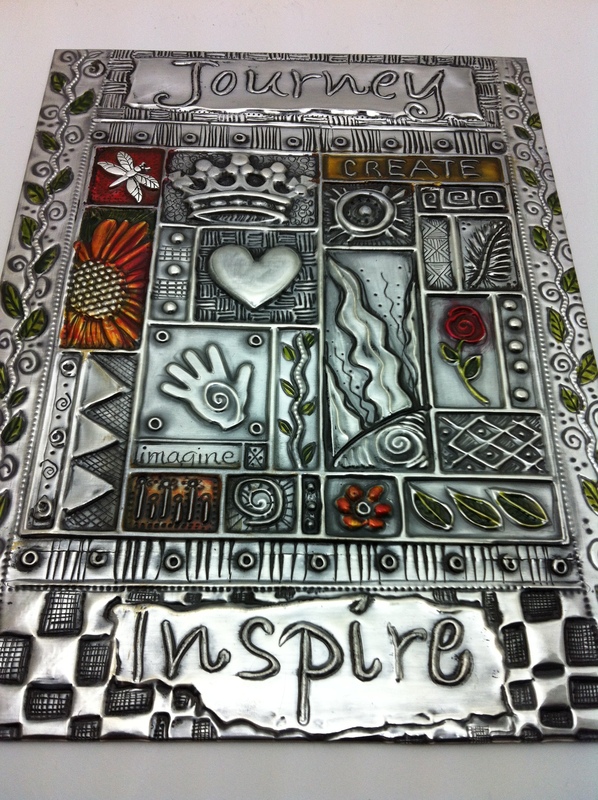 Take some luscious pewter sheet, incorporate various decorative wheels, add some balls, emboss on texture plates, learn how to do lettering on metal, erase everything or nothing, raise the metal, fill with melted beeswax, enhance with alcohol inks and then oxidize with patina……and that is how you emboss on Pewter Metal Sheet. 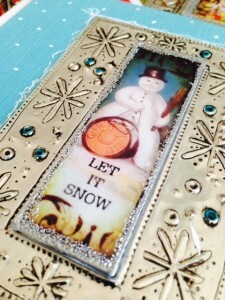 In this 8 hour class you will complete a sampler bookmark with an introduction to different embossing techniques in a nutshell and a pewter sheet Journal Cover (enough pewter sheet provided for 2 covers). 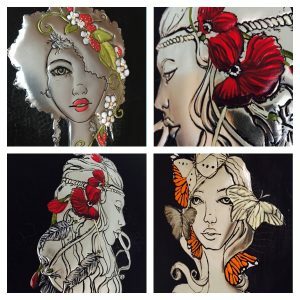 If you are a newbie to metal embossing, this intense workshop will introduce you to a whole new world of magic art metal and if you have done metal tooling before, this workshop will refresh your metal embossing skills and take it to a whole new level of inspiration! All supplies provided as well as a light lunch. 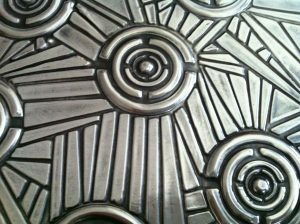 Inspired by “tangles/doodling” this workshop will teach you metal embossing tooling skills as well as how to create interesting “metangles” on 3 pewter sheet pieces. 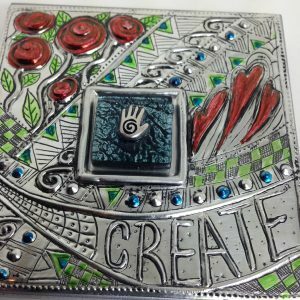 You will learn how to do lettering on metal and beautiful textures to enhance your metal artwork as well as how to create a “bezel” for your tile embellishment. 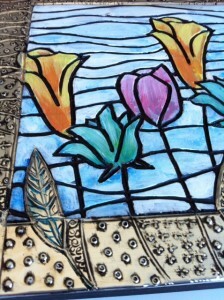 We will add color with permanent markers and glass paint. You will be supplied with three tiles and hooks if you choose to display your 3 metal pieces as wall art. Register and make payment with Paypal Online on www.pewterart.ca under Store and Classes or alternatively contact Elitia on email at harts@shaw.ca or 403 615 9348 for email transfer or Credit Card payment. Full Payment on registration. Unfortunately No Refunds on Cancellation- Credit to be applied to future workshops only. 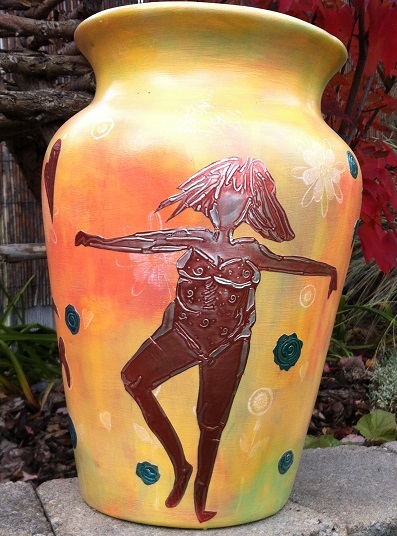 At this exciting new Workshop we will be painting and stamping on a large vase as a backdrop for our funky metal work at the spacious new class room space of Kensington Art Supply Store in SW Calgary. 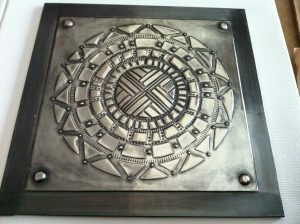 The technique for the metal work is using stencils on aluminum sheets and we will be using the “Loose Woman” stencils created by talented Sue Pelletier from Stencilgirlproducts.com– see photos above. I will have the stencils for sale at the workshop for $ 15.00 each and you would need one 8 x 11 ” for the class-there are 3 different designs and we can interchange our stencils. 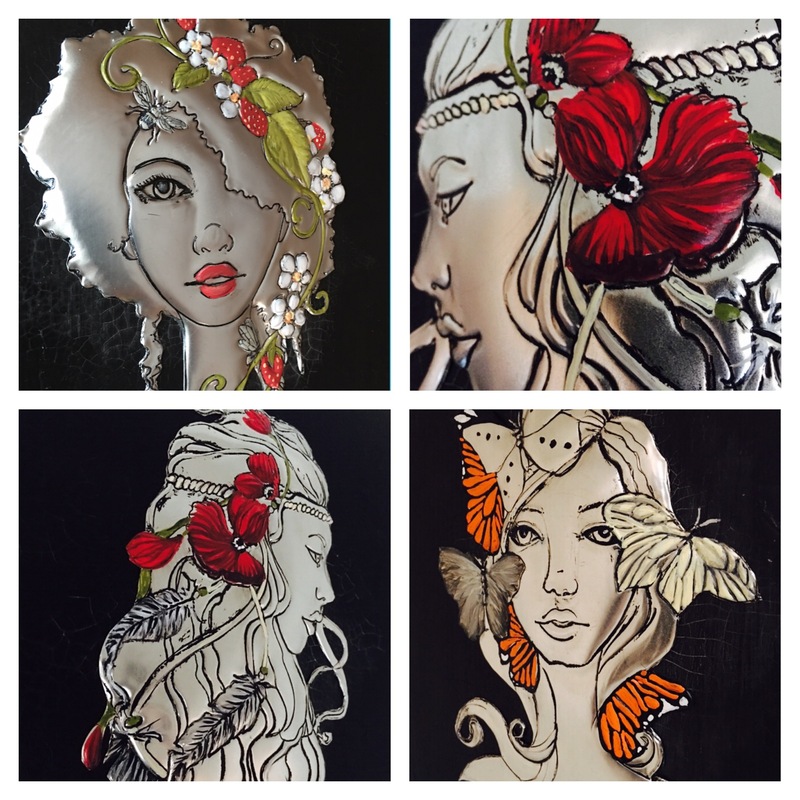 If you would prefer not to use these designs you can bring your own Mylar stencils to use. 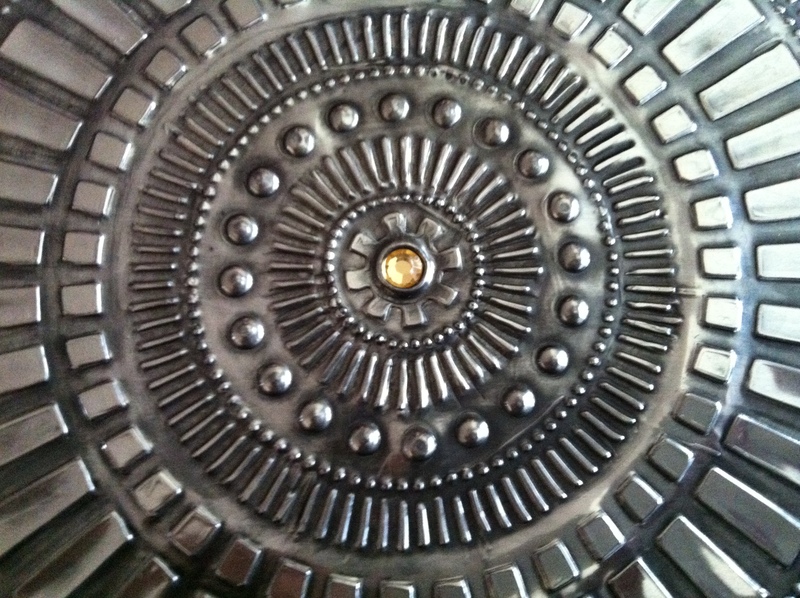 You will be provided with 3 sheets of aluminum to complete the project. Cost : $ 95.00 includes all supplies and a coffee service -please bring a packed lunch. 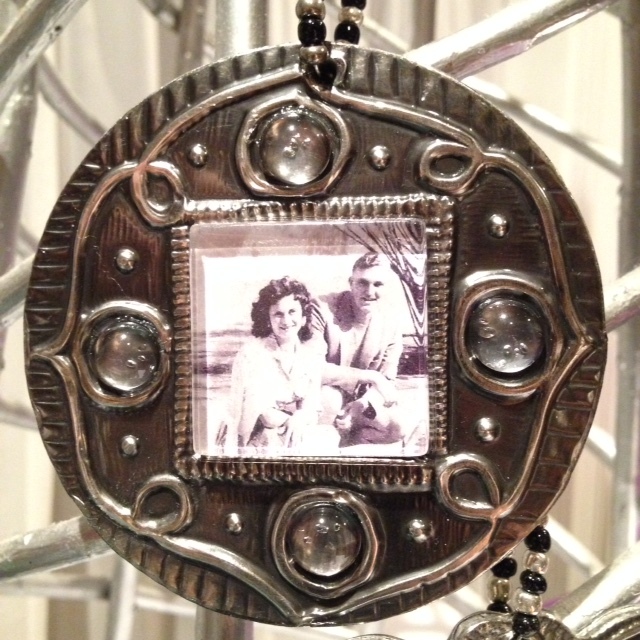 In this lovely wall art project with an antique look pewter embossed centerpiece you will learn a variety of mixed media techniques like crackle background texture, aging your board with inks, artist bitumen and mica powders, applying transparencies onto metal and the advanced embossing technique of creating a ball tool frame for the cabochon beads. Will also use cool fibers to complete our project. 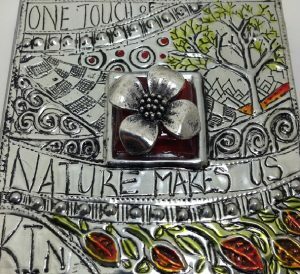 In this 8 hour workshop you will be introduced to the different marks and designs your metal emboss tools make as well as an introduction to various metal emboss techniques, like de-bossing, etching, low relief and then we will take it up a notch by filling our high relief designs with melted beeswax. You will also learn the patina process to oxidize your pewter sheet and to simulate the aging process. All supplies provided as well as a light lunch. In this fun workshop you will work on luscious pewter sheet applying the various metal embossing techniques like engraving, low relief and high relief. 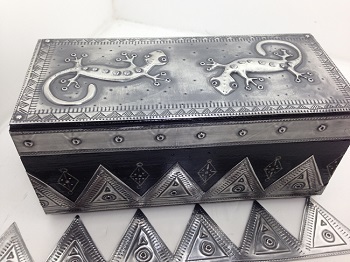 You will fill your raised design with beeswax and learn how to make an interesting zig zag border that will enhance the embossed lid. 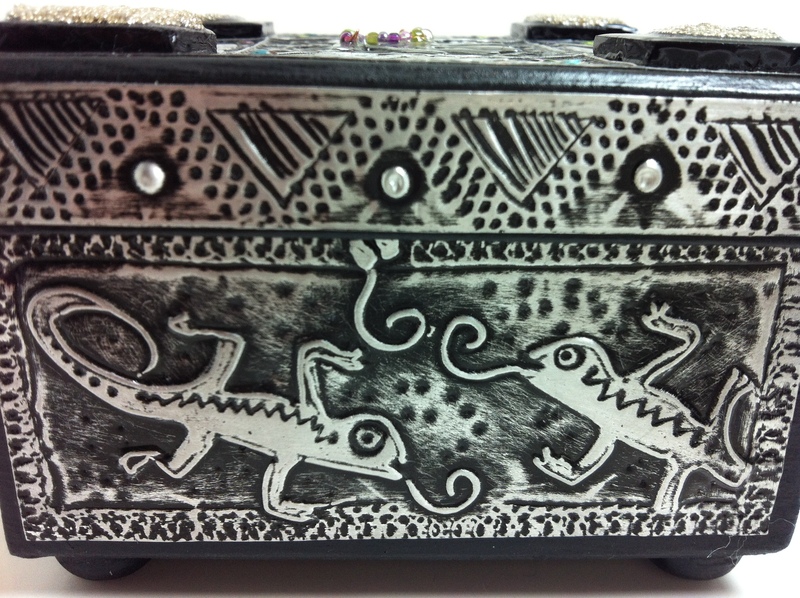 you can choose between a gecko and guinea fowl design. 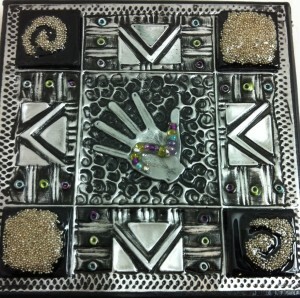 Please click here to register online or go to www.pewterart.ca Store and Classes. Please call Against the Grain Gallery at 403.601.0841 or email atggallery@gmail.com to register! 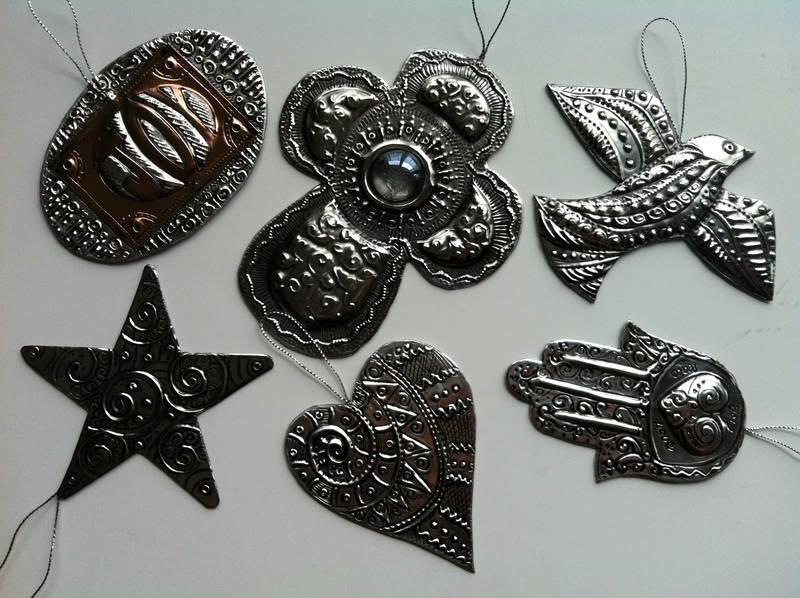 You will complete 4 unique hanging Christmas ornaments using luscious pewter sheet, die cuts from Elizabeth Craft Designs, metal tape, glass and a paper mache form. 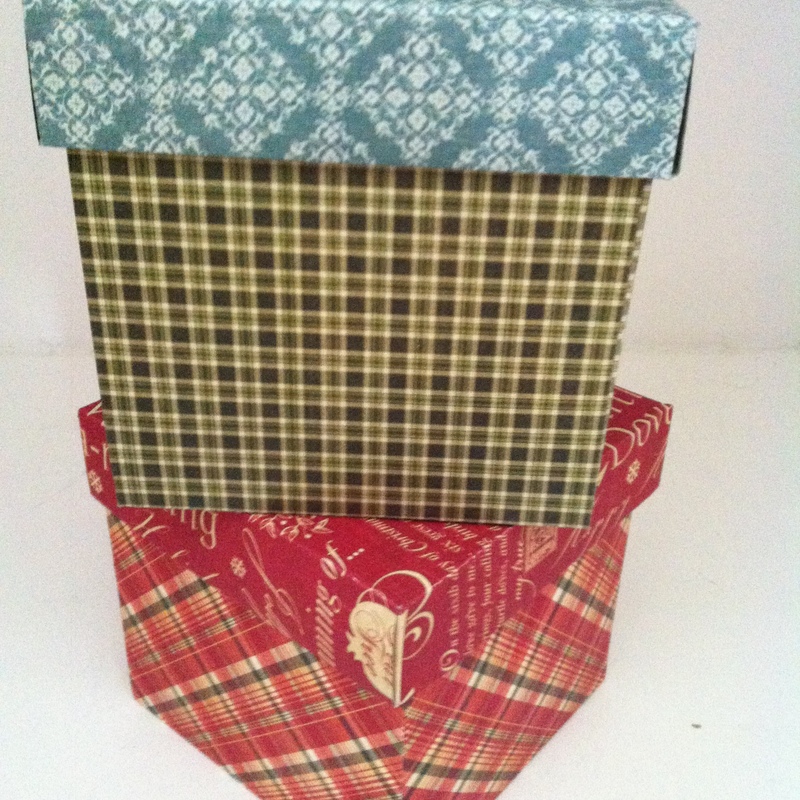 To top it all off you will also learn how to make the 2 lovely gift boxes they will nestle in. 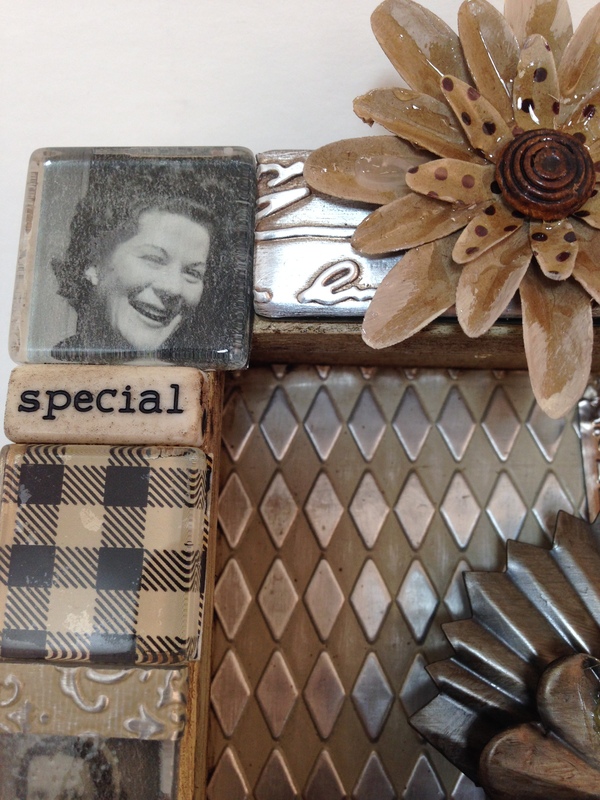 You will be amazed at how you can turn basic supplies into very special gifts. Register Online or contact Elitia on harts@shaw.ca -Full payment on registration. Unfortunately no refunds on cancellation- Credit Only to be applied to future workshops. 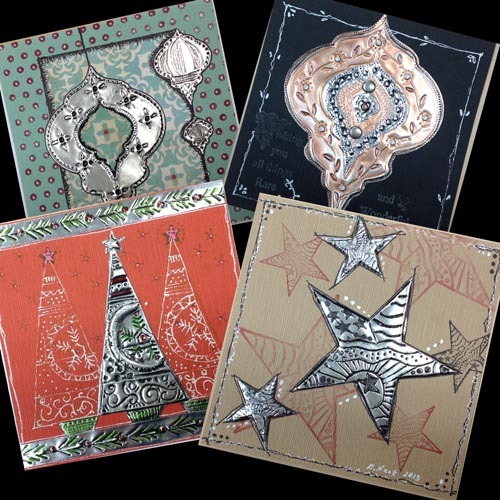 With easy and fun embossing techniques on lustrous pewter sheet you will create and complete 6 different double sided hanging ornaments from scratch.You will be introduced to a variety of metal tooling techniques from embossing, de-bossing, writing on metal, puffing designs and filling with beeswax as well as how to oxidize your pewter pieces to simulate a lovely aged patina. 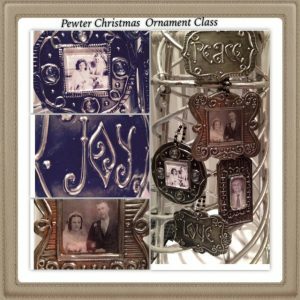 You will receive all supplies needed for this project as well as a template, sample sheet and instructions so that you can complete many more of these ornaments at home. 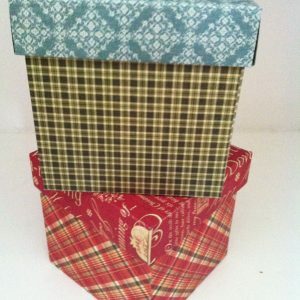 Packed Lunch (optional) – I provide a light finger lunch, coffee and tea. 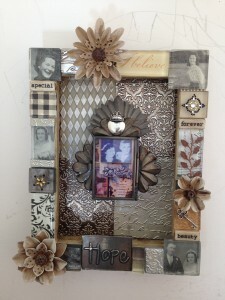 this is a store initiated workshop-Samples available for viewing at Paperpastimes. while making progress on your Christmas Cards for 2013. 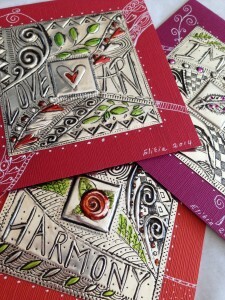 Easy fun stuff-Quickie pewter piece and several cards with Monika, Carole and Elitia. 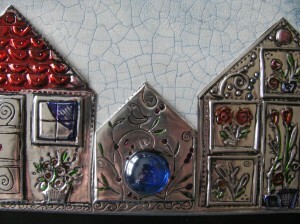 Using the Michael Strong “Houses” stamps we will create this lovely Wall Decor piece. Pewter and Alcohol Inks complete this whimsical piece which can also double as a key hanger. 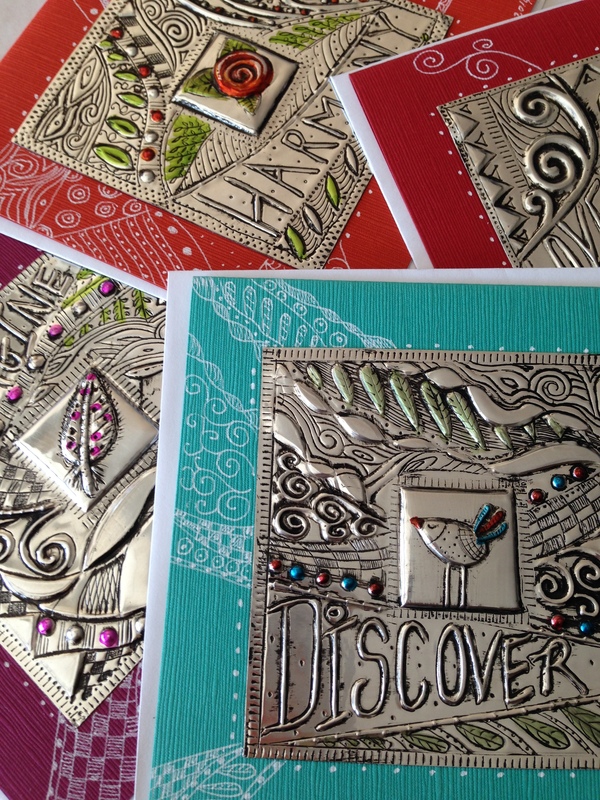 Please bring your Basic Metal Embossing Kit, Be Creative Tape 2.5 ” adhesive tape, Krylon Silver Leaf Pen, exacto knife and cutting mat, scissors and Black Water based Permanent Marker. 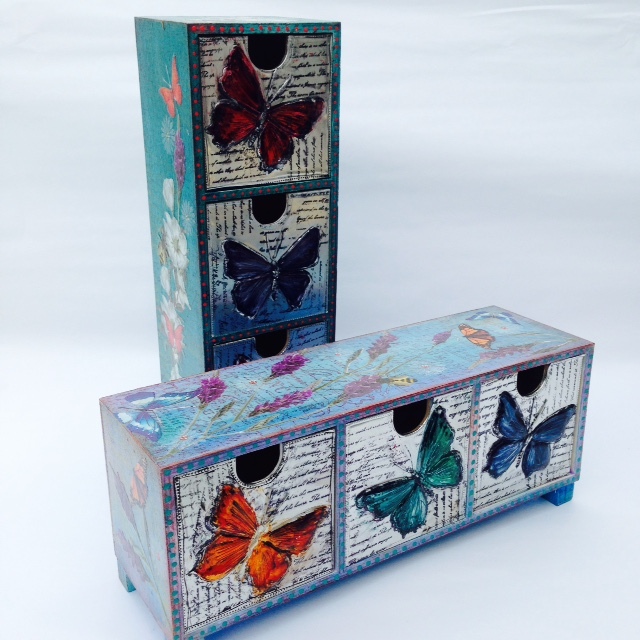 Beautiful Baltic Birch covers decorated with alcohol inks, paper collage, stamps and of course lustrous pewter sheet. Use completed pieces as journal covers or home decor. Please bring your Basic Metal Embossing Tool Kit, Be Creative Tape 2.5 ” adhesive tape, Krylon Silver Leaf Pen, exacto knife ,cutting mat, scissors and Black Waterbased Permanent Marker. 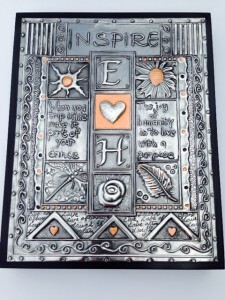 Description : Take some pewter sheet, incorporate various decorative wheels, add some balls, emboss on molds, learn how to do lettering, erase everything or nothing, raise the metal, fill with beeswax, enhance with alcohol inks and then oxidize with patina……and that is how you emboss on Pewter Metal Sheet. 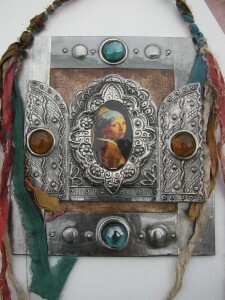 In this 6 hour class you will complete an exquisite bookmark and Journal Cover (enough supplies provided for 2 covers). If you are a newbie to metal embossing, this workshop will introduce you to a whole new world of magic art metal and if you have done metal tooling before, this workshop will refresh your metal embossing skills and take it to new levels of inspiration! 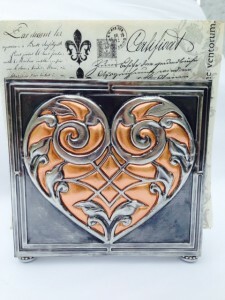 Description : Using two of the lovely Crafter’s Workshop Balzer Designs Stencils you will complete two 6 x 6 inch pewter sheet wall art plaques using your basic metal embossing skills and stencil technique on metal. You will be filling raised designs with beeswax and also learning how to oxidize your pewter pieces with patina to simulate a lustrous aged look. 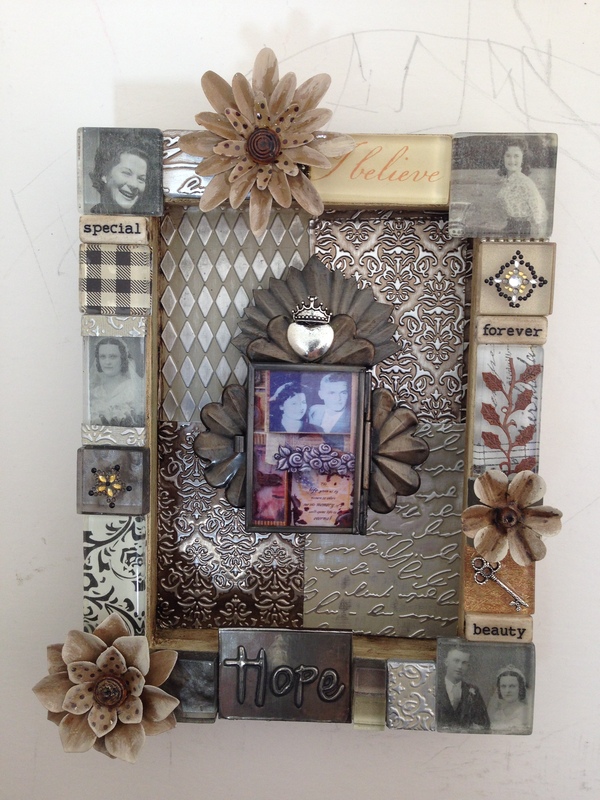 Please contact Carole at Paperpastimes to register for this store initiated workshop – ph : 403-255-8731 – Samples are available for viewing at Paperpastimes. 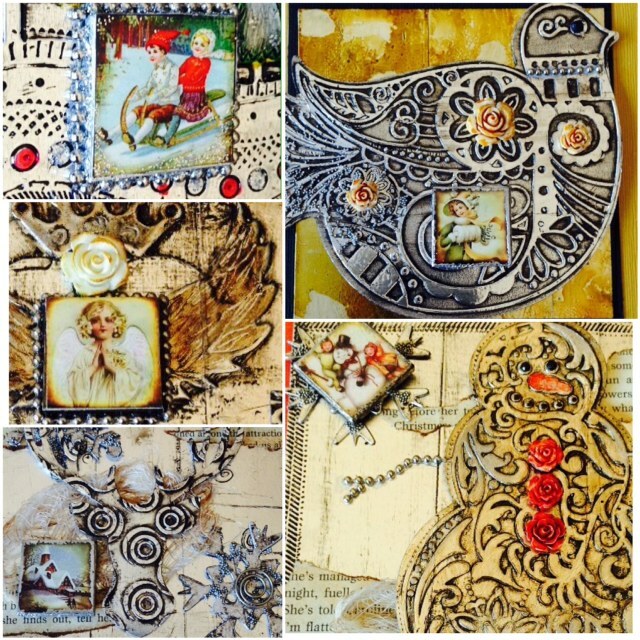 The second Mixed Media and Metal Art collaboration with talented artist Christy Riopel offering instruction in exciting shallow plaster carving and dimensional painting on two 9 x 9 inch prepared canvases . 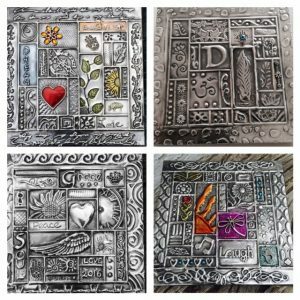 Varied stamps to choose from.In the second part of this full day workshop you will further enhance your artwork with your basic metal embossing skills on lustrous pewter sheet. 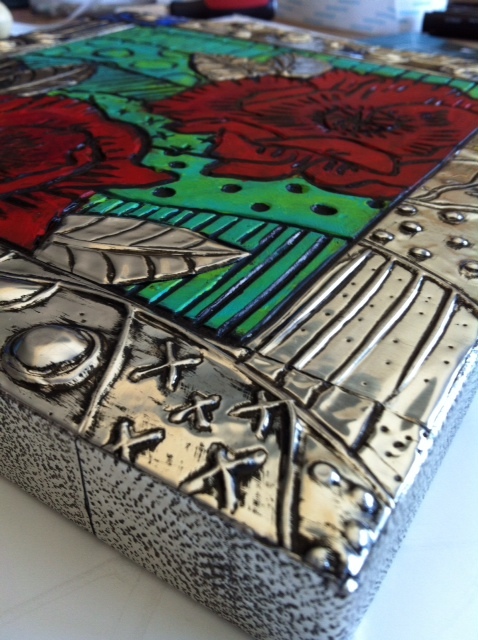 Your completed artwork will boast with a pewter embossed metal frame and creative metal inlay. 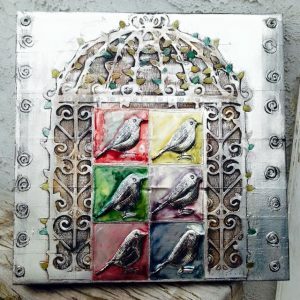 Description : Take some metal, incorporate various decorative wheels, add some balls, emboss on molds, learn how to do lettering, erase everything or nothing, raise the metal, fill with beeswax, enhance with alcohol inks and then sand like you mean it……and that is how you emboss on Metal. 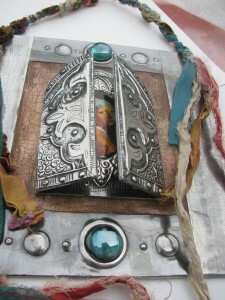 In this 6 hour class you will complete an exquisite bookmark and Journal Cover (enough supplies provided for 2 covers). 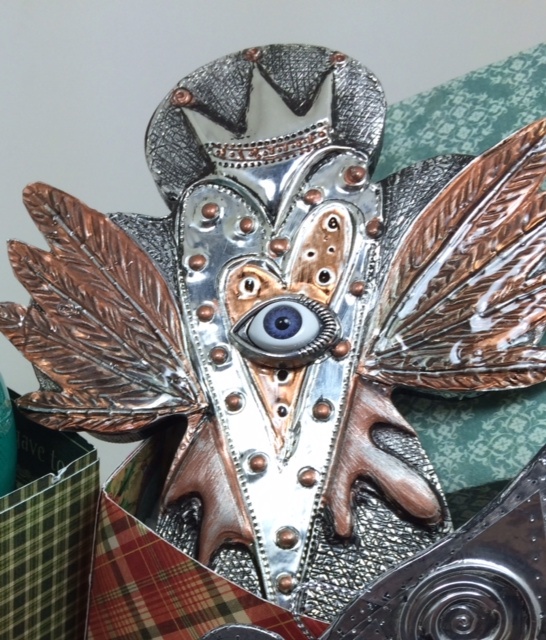 If you are a newbie to metal embossing, this workshop will introduce you to a whole new world of magic art metal and if you have done metal tooling before, this workshop will refresh your metal embossing skills and take it to new levels of inspiration! Exciting collaboration by talented Mixed Media Artist Christy Riopel and Metal Art Instructor Elitia Hart. 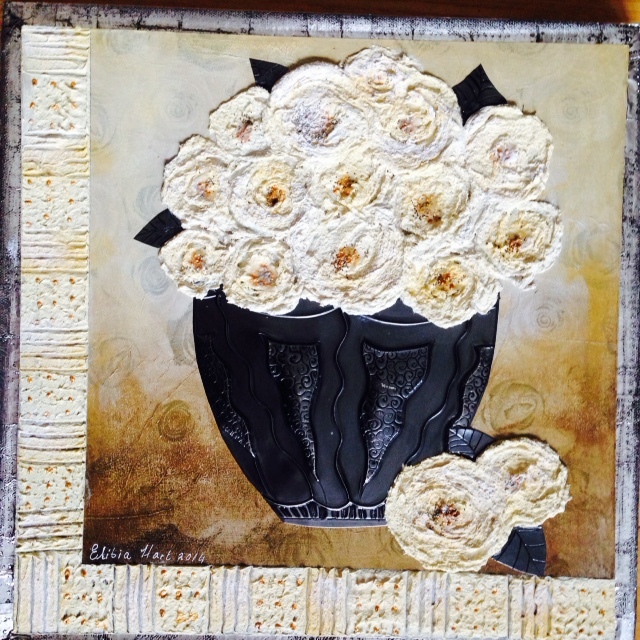 Offering a full day workshop creating four exquisite 8 X 8 inch canvasses with beautiful paint and stamp techniques in the morning session. With the lovely canvasses as backdrop completed you will spend the afternoon with Elitia working on sumptuous pewter sheet with your metal tools and basic embossing skills creating the funky metal art design that will complete your work of art. Only 20 seats available. Where: St Andrew’s Heights Community Centre, 2504 13 Ave NW, Calgary, AB T2N 1L8– Please note there is no street parking in the residential area. Parking is available on the lot by the tennis courts immediately east of the SAH Community Center. 2 Sheets of Be Creative Tape (Sook Wang) 9 x 11 inches approx. Packed Lunch-there is a kitchen at your disposal and we will provide Coffee and Tea on Tap. Location:Paperpastimes #5 – 7640 Fairmount Dr. SE. 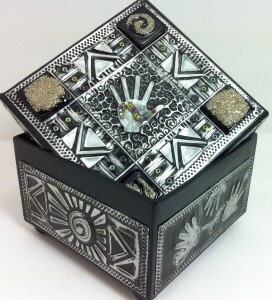 In this 4.5 hour workshop you will embellish a small trinket box 4′ x 4′ x 2′ with Rock Star Black Aluminum and the funky Mimmic Design Stencil. 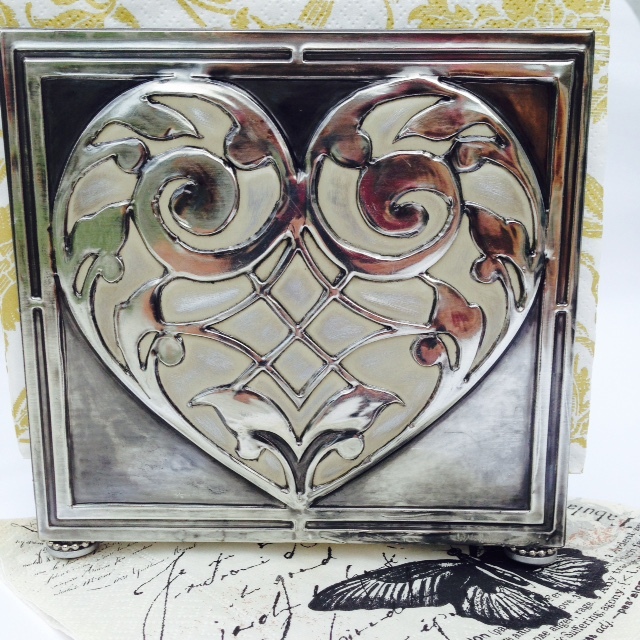 Add some beads, glass tiles and a variety of metal art tool techniques in combination with the stencil to complete this lovely keepsake box. 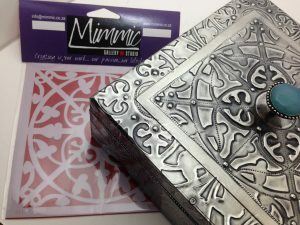 Mimmic Stencil OB BR6 (available only at Paperpastimes for $ 12.95 ) This stencil offers a large variety of different design options. 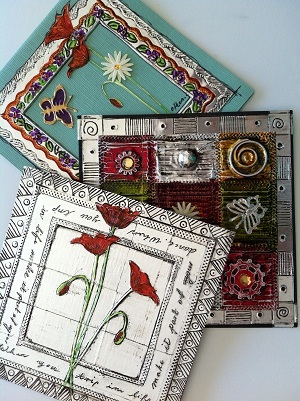 In this 3.5 to 4 hour class we will complete 3 gorgeous “Poppy ” cards using die cuts “on” and “under” metal, applying our metal tooling skills and playing with an old time favorite-metal adhesive tape to create funky metal backgrounds for our sumptuous Poppies colored with alcohol Inks and Permanent Markers. scissors, cutting mat, exacto knife and ruler. (Optional-permanent markers and alcohol inks) .